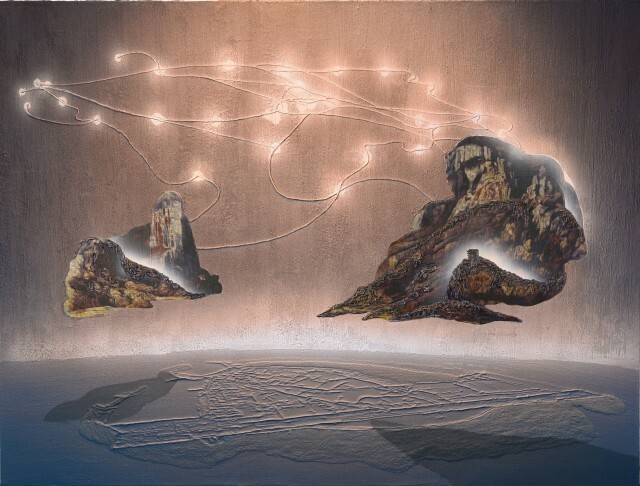 20 June 2016 In his mission to render the history of global capitalism as a sequence of shimmering, troubled techno-vistas, the artist Gordon Cheung has repeatedly, even obsessively, pushed the idea of what a painting can be. He begins with cascades of stock listings taken from theFinancial Times, which he coats in varnish and lays out on canvas. He digitally constructs and fragments images of snaking Middle East oil pipelines, mystical Chinese mountain-scapes and 17th-century European still lifes, then prints them on to the listings. Next, he applies layers of spray paint and sand until the highly charged frames seem to pulsate, inducing a sense of information overload. These dense collages are a play on the Chinese calligraphic tradition known as “painting without paint”, in which inked characters hold both visual and textual power. Cheung’s ink is the data flow of financial markets.